Melt the butter in a microwave-safe bowl; Add in remaining crust ingredients; mix well and press into a tart pan with remove bottom. Refrigerate. With a handheld mixer or standing mixer with whisk attachment, mix all filling ingredients together until fully incorporate. Increase speed and continue to whip until you have the consistency of stiff meringue. 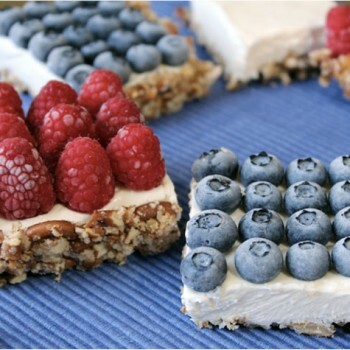 Fill fully chilled crust with filling; top with berries; refrigerate until ready to serve.